• 86% of group practice leaders say regulatory burden has increased this year. • Prior authorization was rated as extremely burdensome by 82% of practice leaders. 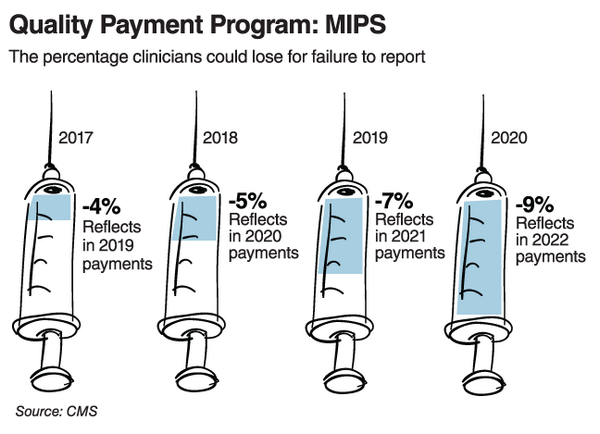 • 2 in 3 say the MIPS program does not support their clinical quality priorities. • 88% say the Medicare Quality Payment Program is the biggest regulatory burden. • Have $90,000 or less in Medicare Part B allowed charges for covered professional services. • Provide care to 200 or fewer Part B-enrolled patients. • Provide 200 or fewer covered professional services under the PFS. The minimum period for each performance category remains unchanged, so quality and cost stay at 12 months while improvement activities and promoting interoperability remain at a continuous 90-day period. CMS says about 93 percent of eligible providers in the Merit-based Incentive Payment System received a bonus for their 2017 performance and the vast majority avoided a pay cut — though CMS Administrator Seema Verma says in a blog post that she expects performance in the program will change as the thresholds are harder to meet.